Chicago Gay Men's Chorus London Gay Men's Chorus & Chicago Gay Men's Chorus Sing! 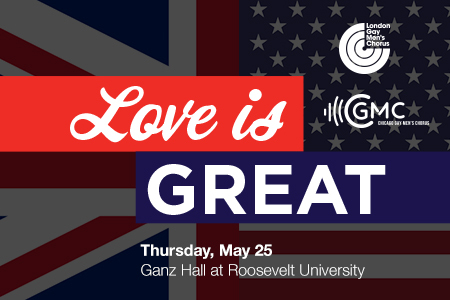 Join us for the British Invasion by the LONDON GAY MEN’S CHORUS on Thursday, May 25, 2017 at 7:30 PM. Chicago Gay Men’s Chorus and London Gay Men’s Chorus will join forces in a wonderful collaborative concert with selections from their spring programs. From sacred choral pieces to Beatles music, this is a concert you most definitely don’t want to miss. Location: Ganz Hall at Roosevelt University, 7th Floor, 430 S. Michigan Ave., Chicago, IL 60605. Tickets are required; seating is on a first-come, first served basis. Guests without a Roosevelt ID may be required to show photo identification to enter the Auditorium Building. Please go to the security desk first when entering the building.